In this image, point to the line that's longest. You most likely said that the bottom line is the longer of the two. This is clearly true. Except that it isn't. 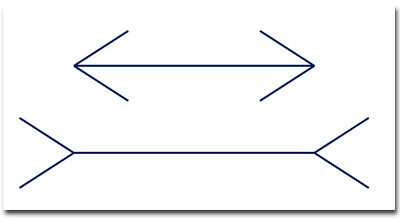 Both of these lines are the same length. Don't believe me? Get out a ruler and measure them. Come on, you know you want to. Believe me now? What is it that is causes us to misjudge the length of these lines? It's System 1. System 1 controls our automatic reactions. In this optical illusion, it tells you that the bottom line is longer. 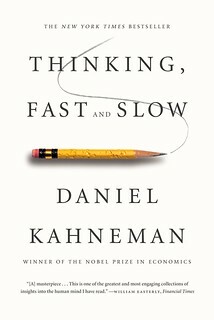 System 2, our slow and deliberate thinking system, just isn't able to engage in effortful thought about every little detail in our lives. We each have a finite amount of brain power, of attention and focus. To make things more efficient, System 2 often lets System 1 handle trivial tasks. But sometimes, an with this illusion, System 1 leads System 2 astray. Often during our day-to-day lives, we rely on System 1. We don't even realize we're doing so. We lean on gut reactions and impulses when deciding how to act. For example, when you're at a party and you see a delicious dessert table, your gut reaction might be, “Outta my way, I'm starving!” (As someone formerly self-described as “husky”, that's my reaction!). This is System 1 in action. But if you're like me — and many people are — you probably have a tendency to ignore System 2 and rush the desserts like a wild person. (In a socially acceptable manner, of course.) It's clear that System 2 thinking can be overridden by System 1 thinking. You can probably guess where we're headed here. Turns out that System 1 can also override System 2 when it comes to handling your money. You might fail to save, for instance, because you'd rather spend on yourself right now. That's the impulsive, impatient System 1 talking. System 1 doesn't want to “lose' money to your future self. People hate losing. In fact, research shows that we feel the pain of losing twice as much as the pleasure of gaining. This “loss aversion” leads us to do all that we can to avoid losing — even when we're not actually losing. When people think about saving money for retirement, it feels like a loss. Why? Because we see our paychecks each month and notice that money is “missing”. It's a loss to our present selves. We can't spend the money today, so it feels like it's lost to us. Now, System 2 knows better, but it's unable to sway System 1. No matter how much we try, System 1 experiences saving money as a loss. And because we hate loses, we do everything we can to avoid them. This means that, in general, it doesn't feel good to save. One way to prevent your brain from experiencing loss aversion is to fool it into not realizing that you're saving. Your goal is to trick the System 1 side of your brain. The best way to do this is to make your saving automatic. All modern banks and retirement savings plans now allow you to automate your transactions. And if you haven't already automated your retirement saving, you should do so. Now. No, I'm serious. I mean right now. Go ahead. We'll wait. By automating your retirement contributions, you don't have to make the choice each month to save. This is good. You're bypassing System 1. Your brain may still eventually notice that the money is gone, but it won't experience it as a tangible loss. That's certainly been true in my own case. I've been saving automatically for several years. The money that comes out of my account is dead to me. I don't even think about it. It's almost in the same category as taxes, unemployment premiums, or charitable giving. I don't even consider it my money, so it doesn't hurt when I “lose” it. System 1 isn't the only villain, though. Deliberate, methodical System 2 can also get in the way of your financial success. Have you ever spent an hour on the phone trying to save $10 on a cell phone bill? I have. This the Pareto principle in action. The Pareto Principle says that 80% of the results for a given activity result from 20% of the effort. System 2 thinks the Pareto principle is bunk. It'll gladly let you spend hours to save pennies…but then refuse to spend a few seconds to save dollars. This isn't to say that you ought not spend the time to obtain small victories. Go for it! But if it takes thirty seconds to save $200 on a car purchase, you'd have to do twenty of those hour-long phone calls that save you ten bucks. J.D. often says that money is more about mindset than it is about math. I agree. Our minds cause many of us to struggle with our finances. Between faulty money blueprints and our two thinking systems, it's no wonder we sometimes encounter hardships. Understanding how our brains work won't necessarily solve your money problems, but it may help you to recognize faulty thought processes when you experience them. And this awareness could help you make smarter choices with your finances — and your future. What do you do to overcome your natural tendencies to make poor choices with money? How do you trick yourself to be smarter with money? Let me know in the comments below (or on Twitter or on Facebook). There are 7 reader responses to "Loss hurts: Loss aversion and how to beat it". Automate your savings is the way to go. As long as the money isn’t in your checking account, it doesn’t feel like a loss. Who scan their paychecks every month? It only feels like a loss if you see the money in your checking account and has to manually send it to the retirement account. Automation is great for new investors. I think my brain is largely immune to loss aversion from stock market volatility now. I’ve been a DIY investor for over 20 years and I went through a few cycles. The stock market always recovered in the past and that experience help build my immunity to loss aversion. I guess the trick is to start investing when you’re young and DIY. Joe, I totally agree about some people having more immunity to market swings than others. I’ve been at it about 7 years so I haven’t seen the huge market swings, but even with the small ones I can tell I’m not wired to be as stressed by them. Knowing a bit about psychology, I know I could be prone though to doing something stupid. That’s why the automation and ignoring the noise is so critical. Thanks for checking out the piece Jim!! Appreciate it!! I’m a big proponent of saving into investment accounts automatically and RARELY looking at them. Over the long run, the market is going to go up. On the other hand, today, this week, or this year, anything can happen. If you’re prone to tinker, just don’t look at it. Set a date once a year or so to rebalance based on a predetermined asset allocation. Beyond that, let that money grow all on its own. A watched pot never boils. 100% agree on the automatic investment of money. You have to plan ahead and know that System 1 is going to pop up when the market is falling. By planning ahead when times are good, you can automate the decision making progress to eliminate those irrational System 1 decisions. Best thing I ever did was to (1) build up my emergency cash reserve, (2) automate my 401(k) (like you said, that money is dead to me now that I don’t see it), and (3) automatically transfer a certain dollar amount from my bank account every month into my brokerage account to dollar cost average. Final piece of advice: turn off the TV and go for a walk when the markets are stressful. Tune out the noise and focus on the long term. I think the assumption that saving for the future is the rational choice is often wrong. When someone in their 20’s is saving money for retirement they are saving out of fear of the future, not based on a rational choice that the money will be better spent in the future. Even the assumption that saving money early for retirement means you won’t have to save as much later is not usually a rational one. Its not unlikely that spending money when you are young is going to be better than the additional money you have to spend when you are 50 because you don’t need to save as much for retirement. 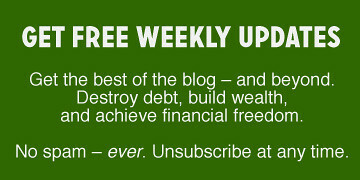 The rational approach to savings and spending is to consider opportunity costs on both ends. The uncertainty of the future means it carries increased risk. But that uncertainty works both ways. Its not at all irrational to decide that the immediate reward is more valuable than an uncertain future reward. In fact, a lot of people are saving for the retirement they imagine but is wholly unrealistic regardless of how much money they have. You go to estate sales and you find people who spent all that money they saved collecting nostalgia from their youth. Essentially buying stuff they couldn’t afford in their youth or threw out at some point. The key to savings is not fooling yourself. Its having a clear idea of how the money will be spent. If you are clear about the reward, its a lot easier to understand and accept the immediate opportunity cost. The key to successful financial planning is spending money well, not saving it. Ross Williams, that’s certainly a contrarian viewpoint for the FIRE crowd, when you say: “Even the assumption that saving money early for retirement means you won’t have to save as much later is not usually a rational one.” I’d look at the numbers on any compound interest calculator for some scenarios on that. I hope, for your sake, that your rational mind can constantly and consistently override the irrational desires to spend and acquire, ignoring the swiftly oncoming future. “Opportunity costs” are great to recognize, unless that tag gets slapped on a whole lot of things that you regret, woefully, years down the road. In other words, for a lot of people this would not work, and I hope you are not fooling yourself. I feel like Joe somewhat immune against losses and i´ve been like him a DIY-investor for 15 years now. During that time i developed a mindset, that helps me to ignore the market cycles. For me investing in the stock market and buying stocks for my portfolio is the same as paying down debt for a homeloan. I feel it is a kind of “forced saveing”. The result for the houseowner is, that he´s the owner of his house and he can life without paying rent. After i paid down my “houseloan” i´m owner of 20 different companies and the dividends i receive are my method of living without paying a rent for my home. So, if i buy stocks the most important thing to me are the dividends. Therefore the stocks i buy are mostly dividend aristocrats as they are relative reliable dividend-payers. Price of a stock is only important when you buy or when you sell stocks. As long as they pay dividends or even better grow their dividends i don´t even think of selling stocks – so the price of the stock is not important. And if I want to buy a stock i usually choose the stock in my portfolio with the lowest price so that i can take advantage of the cost-average-effect. So, the lower the prices the better for me as I can buy more “dividends”.